Habermas and Religion aims to present a series of original and sustained engagements with Habermas’s writing on religion in the public sphere. Contributors to the volume respond both to Habermas’s ambitious and well-developed philosophical project and to his most recent work on religion. The book closes with an extended response from Habermas – itself a major statement from one of today’s most important thinkers. The volume is essential reading for philosophers and sociologists of religion and generally for anyone concerned with religion and politics, writes Gerard Delanty. Habermas and Religion. Craig Calhoun, Eduardo Mendieta and Jonathan VanAntwerpen (eds.). Polity Press. October 2013. In various writings since 2001 Jürgen Habermas has made a major contribution to the notion of the post-secular, a concept that has gained increased attention in recent years across a wide spectrum of social and political thought. This key volume is addressed to Habermas’s attempt to re-think the relation between religion and modernity under the conditions of the alleged changed circumstances of the present day that supposedly question a particular understanding of modernity associated with the European Enlightenment legacy that separated reason and faith. A problem for all fourteen contributors and the three editors in their editorial introduction is that the concept of the post-secular is particularly elusive due to its different meanings in relation to philosophy, in relation to the emergence of modernity and in relation to political practices. The volume, which includes a long Reply by Habermas, makes significant progress in clarifying some of the issues around the interplay of the post-secular and the post-metaphysical. It is hardly surprising that the notion of the post-secular is hotly contested, given that the notion of secularization that it obviously presupposes is also unclear. 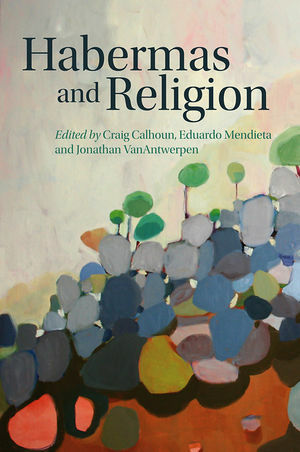 The opening chapter by Jose Casanova is an incisive analysis of the multiple meanings of the concept of secularization. The post-secular for Habermas refers, firstly, to a sociological account of the current situation in those parts of the world that have experienced secularization, understood broadly as both a separation of church and state, the privatization of faith, and the general decreased importance of religion in public life. A feature of the post-secular condition entails a shift in consciousness that allows a certain public recognition of religion, for instance where it might be in the interests of justice for minorities. This is a condition that is relatively clear in respect of national societies within Europe, which have to come to terms with religious minorities, and in a context in which religion no longer represents a threat to democracy. A complicating matter, and the subject of the chapter by James Bohman is that the post-secular is also a global condition in that worldwide there is an apparent rise in religion and in societies that did not experience the European route to modernity via secularization. If the post-secular required only a re-interpretation of the relation between modernity and religion, the debate would be relatively uncontroversial, since there is now general agreement that Europe – with due regard to the diverse routes and forms that secularization took – was exceptional in its model of secularization. The controversial issue in the debate – the second and complicating step – is rather that Habermas has made the claim that the cognitive claims of faith must now be considered to have a value alongside the claims of reason and that there is a mutual learning process to be conducted from their engagement. This is where he differs from Rawls’s less demanding account of the conditions of pluralism, a topic explored in the chapter by Cristina Lafont. Secular citizens cannot write off religion, ignore it or ridicule it, he claims and, against Rawls, they must do more than simply accommodate it; they must engage with the potential semantic and cognitive content of faith. It is on the potential learning within religious worldviews that that the contributors – generally sympathetic to Habermas – are divided, with some taking up a strong position against the proposal and others to varying degrees supportive. However, this is less a case of for or against a proposal, since for some – most prominently J.M. Bernstein for whom the proposal ultimately results in a repudiation of reason – Habermas has gone too far, while for others, more critical of liberal theory, Mathias Fritsch, John Milbank and Nicholas Wolterstorff, he has not gone far enough. Most other contributors have sought to find a mid-way position on an issue that centrally resolved around what might be termed the translation thesis. Roughly it is this. Habermas’s argument – an apparent reversal of his earlier strong context transcendence position – is that religious faith contains truth claims that can be redeemed and in principle permitted in public discourse. Secular citizens should be prepared to engage with religious arguments so long as those arguments can be translated into terms familiar to secular citizens. Both secular and religious citizens have to make an effort to be understood, though apparently the latter have to make bigger efforts. For some this is going too far, but for others it is making too strong demands on religion which is forced to be translatable, thus surrendering to reason in that the language of the latter is ultimately what is dominant. While this all makes a considerable concession to the contextualist position that Habermas had hitherto strenuously rejected in favour of context-transcendence, in the view of Thomas MacCarthy it makes too strong demands of faith. Overall, the contextualist position appears to command the most support. In the end the translation thesis is probably indefensible, thus reducing the post-secular argument to the less controversial socio-historical thesis on modernity and the related problem of the degree to which religion can be permitted in the public sphere. For this reason it is hard to agree with the strong argument of Milbank that religion should be put on a more equal level with reason. What this argument forgets is that secular reason commands greater support than religion, which is divided confessionally. Curiously there is little engagement with non-Christian religions. Habermas’s problem is that, in the terms of Amy Allen, he want ‘to have his cake and eat it’, that is, he wants to salvage the potentially positive aspects of religion without sacrificing too much of reason. Salvaging the positive aspects is undoubtedly easier than disposing of the negative ones. Yet, it is clear that Habermas, despite this claim for the recognition of the cognitive claims of religion, ultimately adheres to his strong defence of the priority of reason, which now is only required to listen to the demands of religion and in terms ultimately set by reason. His Reply to the contributors is a convincing defence of his project, albeit with a considerable easing of the demands that can be made of religion and consequently a much reduced scope for the post-secular moment. It would appear from the very finely developed contributions that Habermas has touched on a problem the solution to which is not necessarily to be found in the claim that reason and faith have to be reconciled cognitively. The relation between faith and reason is more entwined that has often been thought, for instance it can be argued that with modernity religion adapted itself to reason and, perhaps more controversially, there was a co-emergence of both. Since this is a volume on Habermas and religion, it was inevitable that much of the focus would be on thorny philosophical questions on the claims of truth in religion and the extent to which postmetaphysical thought needs to address faith. There are clearly problems in the ways the post-secular maps onto the post-metaphysical. The implications of sociological dimension of the post-secular proposal are in need of further attention, in particular in the global context. After all, as Amy Allen points out, it is not individuals but states that are either secular or religious. In the European context the problem of religion is a relatively minor one to be solved pragmatically either by multicultural policies or through piecemeal reform based on compromise and accommodation than on mutual learning. What is there to be learnt from religious zealots, who in fact generally do use secular arguments to defend their positions (and thus fulfil one of Habermas’s conditions)? A greater problem on which discussion is missing is that from a global perspective the problem of religion is not really one between faith and reason, religion and secular politics, but between different religious positions. The post-secular proposal as put forward by Habermas has very much derived from the western context where the problem can be characterised as a conflict between faith and reason, whether the examples are creationism, the permissibility of religious symbols, be they the crucifix or headscarf, in the public realms, abortion or gay marriage. Aside from these examples, most religious citizens fully accept secular arguments as far as political community is concerned, so the objective problem is not entirely apparent why more or less successful multicultural societies need to become post-secular. Is there not a danger of making too strong a concession to extreme positions? From a global perspective, the world-wide growth of Pentecostalism and Islam for instance present different challenges. Religious conflicts between different confessional groups are not so easily accommodated within the conceptionalization of the post-secular as put forward by Habermas. I would have liked to read more on the global context of conflicts between different religions and their internal variants in societies where the tension between reason and faith took a different form than in Europe. The collection is very well edited and offers rich insights and analytical acumen by outstanding scholars on issues of considerable importance. The volume is essential reading for philosophers and sociologists of religion and generally for anyone concerned with religion and politics. Gerard Delanty is Professor of Sociology and Social & Political Thought, University of Sussex, UK. His most recent publications are Formations of European Modernity: A Historical and Political Sociology of Europe, Palgrave 2013 and The Cosmopolitan Imagination: The Renewal of Critical Social Theory, Cambridge University Press, 2009; he has edited the Handbook of Cosmopolitanism Studies, Routledge 2012 and co-edited (with Stephen Turner) The Routledge International Handbook of Social and Political Theory. Routledge, 2011. Read more reviews by Gerard.